Since people tend to fear a diagnosis of dementia, they often ignore early signs of cognitive impairment. But the fact is that early detection can lead to early treatment, participation in clinical trials and emerging therapies for this challenging condition. By acknowledging early signs of possible dementia, a person can make decisions that will help loved ones follow her wishes later. “Dementia” describes a condition that may show up initially as difficulty with memory (especially short-term memory), problem-solving, judgment, speech or other issues. The most common cause of dementia is Alzheimer’s Disease (AD), which accounts for 60-80% of cases. Other types of dementia in addition to AD include vascular dementia, dementia with Lewy bodies, dementia caused by Parkinson’s Disease, and others. Unfortunately, diagnosis of a patient’s precise type of dementia often cannot be reached until after the person dies. But most types of dementia present in similar ways. Thus people often refer to a person living with dementia as someone with AD. More than 5 million people in the US are living with Alzheimer’s dementia today. Experts believe that number could rise as high as 16 million by 2050. After you turn 65, your risk of Alzheimer’s doubles every five years. The result is that, by the time a person is 85, he faces a 32% chance of having AD-caused dementia. Mild Cognitive Impairment (MCI) indicates a slight but measurable decline in a person’s cognitive abilities. MCI typically does not disrupt a person’s activities of daily life, but there may be areas where she requires assistance. A person with MCI is at higher risk of developing Alzheimer’s or another dementia, but MCI itself is not always a precursor to full-blown dementia. Medications or other factors could be causing a person’s cognitive impairment. It’s always best to consult a physician who can rule out certain conditions and narrow down the diagnosis. Note that the occasional “senior moment,” like forgetting to pay a bill on time, is not the same as experiencing ongoing difficulty with bill-paying or managing a budget. The latter might suggest a person has experienced cognitive decline. If you suspect dementia may be present, here are six things you should start working on now. Note that the following guidelines address the family member of a person with possible dementia. But if you think you have experienced cognitive decline yourself, work with a loved one to take action in these areas. Nothing is gained by delay. When a person first notices that she, or a loved one, is having trouble with routine tasks like managing appointments and paying bills, it’s easy to dismiss concerns about cognitive impairment. Instead, one might attribute such symptoms to fatigue, anxiety, “just old age,” and so on. This is especially true in the case of an elder who has always been the one to organize family logistics, remember all the cousins’ birthdays and handle complex details with ease. Additionally, because many people attach a sense of stigma to cognitive impairment, they may refuse to seek medical advice. The elder may interpret any suggestion that he has cognitive problems as an insult to his intelligence, or even to his worth as an individual. A person with a cognitive impairment is still an intelligent person. In situations like this, it can hard to understand that cognitive decline results from a disease that affects the brain. While cognitive impairment can sometimes result in embarrassing situations, it is not a condition to feel ashamed about: it is NOT the person’s fault. The underlying cause of Alzheimer’s dementia is Alzheimer’s Disease — which is a disease in the same way that hypertension and diabetes are diseases. Let me speak plainly: Dementia-causing diseases impair the brain’s ability to form short-term memories, do complex tasks, exercise judgment and eventually to move one’s body, get dressed or even speak. Dementia-causing diseases’ progressive decline is nothing short of cruel. Top researchers are working to understand and develop a cure for AD, but so far there is no way to stop its inevitable march. You can help a loved one who shows early signs of cognitive impairment by encouraging her to seek out possible explanations and interventions for the symptoms. If nothing else, you can suggest that getting a baseline report of physical and mental function can help her and her doctors down the road, if she should experience new issues. Why diagnose a disease that has no cure? What’s the point of early diagnosis of a disease that has no cure? There are several. First, there are medications that can slow down cognitive decline, especially when taken early on. Second, early diagnosis puts a person in charge of making decisions regarding future arrangements for finances, health care and housing. It may be hard for him to acknowledge it, but right now he is still able to participate fully in such decisions. A time will likely come when he can’t be as involved. Connecting with others facing similar diagnoses is another benefit of an early diagnosis. Support groups offer ways for individuals and care partners to access helpful information and meet people in similar situations. There are always new treatments being developed, as well as new recommendations on nutrition and lifestyle for Alzheimer’s and other dementias. Having an early diagnosis allows a person to take advantage of potentially revolutionary approaches to combat dementia-causing disease. Depending on how much difficulty a loved one is experiencing with tasks like paying bills, making sure you or another responsible relative has access to financial accounts may not seem urgent. However, because executing legal documents and gaining agent authority on accounts can take time, you should start this process now. At a minimum, your loved one needs a will, a durable power of attorney (POA) for finance, and a durable POA for health care. When designating a durable POA for financial or medical matters, a person should make sure to choose someone in whom she has full confidence. The same person(s) can be designated as medical and financial agent, or your loved one may designate different people. Regardless, two separate POA documents are usually required. It’s best for your loved one to create a “durable” power of attorney rather than the type that “springs” into effect only when the signer becomes incapacitated. Getting a doctor or judge to declare your elder “incapacitated” at some future point may prove troublesome and time-wasting. Also note that, even with a financial POA, many financial institutions require that their account holders designate “agents” who can act to transfer funds, pay income distributions and so on. Contact your elder’s banks and retirement institutions to see what they require. Obtain the appropriate forms and have your loved one sign them, in front of a notary when necessary. 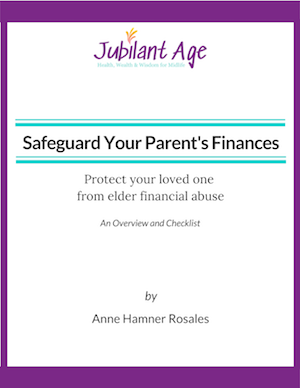 The elder should also add the POA for finance as an authorized signer on his main checking account. In this way, he can reduce the risk of service interruptions and penalties from unpaid bills. Such precautions will give your loved one greater assurance that there won’t be disruptions in income or payment of expenses as time goes on. Drafting a POA for health care, also called a medical agent, is a critical decision. In choosing a medical agent, the elder has an opportunity to communicate choices for treatments she does or doesn’t want to have. It may make the most sense for the elder to designate as health care agent a relative living close by, but convenience alone should not determine this choice. Like one’s financial POA, the health care agent must be a person in whom the elder has great confidence, who she believes will make decisions according to her expressed wishes. Although legally, one’s designated health care agent is entitled to view a person’s medical record and interact with medical personnel on the individual’s behalf, there can be misunderstandings. Physicians’ receptionists and other medical “gatekeepers” operate with confusing restrictions regarding access to information and HIPAA (Health Insurance Portability and Accountability, a US law that protects patient privacy). Because of office policies that derive from HIPAA constraints, medical personnel may refuse to discuss your elder’s condition with you, even if you hold medical POA. You can avoid frustration by having your elder sign the appropriate HIPAA forms at his doctors’ offices, which will give clinic personnel specific authority to discuss the elder’s medical records with you. Although you don’t need to convince your loved one to move out of her home immediately, you’ll want to discuss housing options with her. Even if she prefers to stay in her own home and can do so now with the help of relatives, neighbors and friends, there may come a time where her needs require the assistance of paid caregivers. You’ll want to analyze her finances and consider what options your loved one has going forward. If appropriate, engage a professional financial advisor to assist you in projecting your loved one’s expenses under different scenarios. You can help your elder by laying out the costs and benefits of various housing options in an easy-to-understand way. It’s best not to rush her to decide, but rather encourage her to think about making a choice while she can. If her health deteriorates, she’ll have fewer options available to her in the future than she does at the present time. Even if your older adult refuses to consider alternative housing arrangements, you should make your own “Plan B.” Take the time to visit assisted living facilities and learn about services provided by home health agencies. No one wants to contemplate a parent’s potential decline in physical or mental health. But being prepared ahead of time is much better than having to scramble if medical personnel suddenly inform you that your parent can no longer live alone. If your loved one is diagnosed with MCI or dementia, you can benefit from connecting with a support group for caregivers, or “care partners” as they are often called. Ask your loved one’s clinic or local Alzheimer’s Association for referrals to support groups in your area. Even though you may not be providing physical care, and may even live far away from your elder with dementia, you are still a care partner. It will be most relevant for you to connect with a support group for care partners of people at early stages of the disease. People with loved ones who have advanced dementia generally have different concerns from what’s presently on your mind. Similarly, your loved one can benefit from participating in a support group for people with MCI or early-stage dementia. Not only will others share tips and tricks that help them manage daily affairs. Your elder will also see first-hand that all kinds of people suffer from Alzheimer’s Disease, even “normal” people like her. If your parent rejects her diagnosis, of course, it will be difficult to convince her to attend a support group. That’s okay — she can make her own choice. But you can still go to a care partner group yourself. In time, she may change her mind and decide to check out a local support group. One of the most insulting things a medical or financial professional can do when talking with you and your loved one with dementia is to speak to you only, as though the older adult isn’t in the room or doesn’t understand. Hopefully, your parent’s doctor and other providers do not behave in this way. Nonetheless, you should make sure to include your loved one in discussions. If the older adult resists your involvement, it may be necessary to call the doctor’s nurse before and/or after an appointment, to provide additional information and clarify instructions as needed. You may end up on the receiving end of your elder’s sadness, confusion and anger at their situation, particularly if their diagnosis results in the loss of privileges that convey a sense of independence, like driving. If this happens, try not to take the behavior personally. Remember, too, that you can choose to end a conversation that is going sideways. It’s generally better to withdraw than to get into a shouting match or argument with someone whose logic is impaired. Here’s an account of a mistake I made by not withdrawing from a conversation with a person affected by dementia. Alzheimer’s is a disease that proceeds slowly. While you don’t have to tie up all loose ends the moment you suspect or receive a diagnosis, starting early will help you in the days and years to come. You can best assist your loved one by making sure her finances are in good shape, her preferences for health care and housing are clarified, and that you (and she, if she so chooses) receive valuable support and affirmation from others who understand what you’re going through. You and your parent probably have experienced a number of ups and downs in your lives together so far, and the years that follow will surely continue this trend. Respecting your elder’s life experience and helping her to live with as high a quality of life as possible is a way you can carry out the Biblical commandment to “honor your father and mother.” There will be difficult days ahead, but also some happy ones. What other things do you suggest doing, if a loved one shows early signs of cognitive impairment?